taste; hate the calories. Some foods, like lasagna, actually taste better the second time around. The problem is, leftovers in the fridge call my name. I don’t know how, but last night’s lasagna was able to communicate with my too-easy-to-entice brain, whispering “Eat me, you know you want to, eat me, already”. Now, there are certain vocalizations I’m completely equipped to ignore, like the vocalization from my conscience, urging me to “exercise”. Against the siren song of leftovers, however, I’m completely defenseless. For my husband, a charter member of the “Clean Your Plate Club”, throwing out food, even bad food, is a sacrilege . Having leftovers in the fridge seems to give him comfort; as long as we have leftovers, we’ll never go hungry. My son and I agree, more than two meals in a row containing the exact same components is going above and beyond our gastronomic capacity. My preference is to throw out less-than appealing cuisine. Once is enough. Put the food (and us) out of our misery. During my husband’s daily inventory of the contents of the fridge, the question of “What’s happened to the leftovers” inevitably comes up. During these inquisitions, I’m torn. Am I honest with him, and confess to throwing out the undesirable food, resulting in a tirade about wasting food, and threats of cutting the grocery budget to the essentials (cheese and dog food). More often than not, I tell him that we ate the atrocious food for lunch (a little white lie), because, like Jack Nicholson’s character in the movie, “A Few Good Men”, my husband “can’t handle the truth”, and peace in the home is preserved, at least until our next meal. Some people are able to “morph” their leftovers into a culinary creation virtually unrecognizable from the original dish, like turning roast chicken into chicken “magnifique” (a term rarely used to describe my original culinary creations.) To my credit, I have tried this Power Ranger tactic a couple of times. The results have been less than stellar. The reactions to my latest creations run from “Nice try, Mom”, to “Do we have any fast food coupons?” Let just say, Rachael Ray I’m not. Unsuccessful at morphing leftovers, I started giving them to our dog. Often, in fact. When my son started looking up stats for the World’s Heaviest Dog in the record books to see how our dog compared, I realized the error of my ways. Fortunately, she wasn’t a record-holder– yet. After a stern talk from the vet at our dog’s annual check-up, and a prescription for doggy diet food, the dog’s no longer an acceptable receptacle for leftover disposal. So, we’re back to the problem of what to do with all those leftovers. Restaurant portions are large enough to feed a family of four. If you’re able to convince your spouse to share a meal with you, great, problem solved. I’ve not been successful at this request, however. My husband wants an eighteen ounce Porterhouse steak, while I want chicken or fish. Finding ourselves at an edible impasse, there’s always leftovers to wrap-up. And, speaking of wrapping up, I’ve got to wrap-up my thoughts on leftovers. 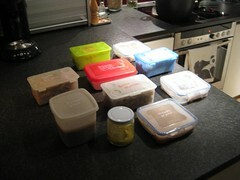 My husband wants to take me out to eat–so, we can, you guessed it, have some more leftovers. And, so on, and so on…Eat it again, Sam. While waiting for a doctor’s appointment, just prior to my fiftieth birthday, I read an article in a health magazine titled, “Over Fifty, Proceed with Caution.” Choosing to ignore the ominous warning on the cover, I dived right into the article, unaware of the “terrors” ahead. One of the first items I read was how women 50+ can expect to gain one inch around their waist every three years, without so much as an extra potato chip in their diet. Oh, say it isn’t so. Already thick-waisted, ( I believe apple-shaped is the correct term), I found this tidbit of information quite alarming. According to the article, I’ll have to call out a search party in order to locate my waist in a couple of years. In fact, that’s something I have in common with Scarlett O’Hara–no, I don’t have a seventeen-inch waist, but I do have a waist that has “Gone With The Wind”. According to the research, and given that my grandmother lived to be almost 102, I can expect my waist to grow to roughly the size of a tire–an airplane tire. Being a wise shopper, I have already begun preparing for the coming girth by stocking up on elastic whenever it’s on sale at the fabric store. Just because I have a big waist, doesn’t mean I have to be wasteful. In addition to cornering the market on elastic, another delightful effect of turning fifty is the loss of most of my eyelashes. Apparently, we are born with three rows of eyelashes. By the time we’re fifty(that seems to be the magic number) we lose two of those rows. They just fall out. That certainly explains why more mascara ends up on my eyelids than eyelashes these days. To resolve this, I’ve contemplated wearing false eyelashes. With my fifty-year old eyesight, however, the eyelashes would probably end up on my cheeks, instead of my eyelids. Not exactly the effect I’m looking for. Not only eyelash- deprived, hitting the half-century point often results in a slower metabolism. 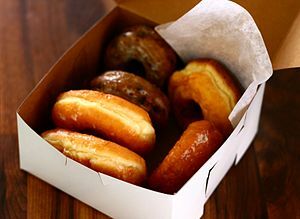 After fifty, our metabolism hovers somewhere in the neighborhood of your average tree sloth‘s. Basically, the only way that I can maintain my current weight is to cut my caloric intake from 200 to 500 calories per day(I guess that means the leftover Halloween and Christmas candy are out), while simultaneously training for a triathlon. And, speaking of the tree sloth, they have one major advantage over us human sloths. Their elimination schedules are in sync with their slow metabolisms. 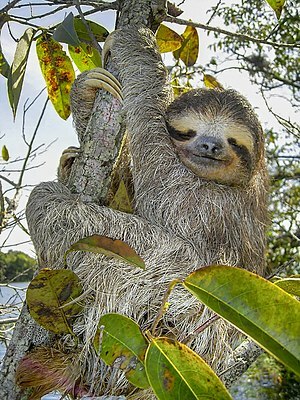 Meaning, tree sloths climb down trees but once a week to “do their business”. Ironically, we human sloths “go more” the slower we get– and, at the most inopportune times. Nature inevitably calls at 3 A.M. So, aside from purchasing my underwear from an airplane factory, my eyelashes from a costume shop,( or, in the alternative, settling for scary naked eyes), and being jealous of tree sloths, I am negotiating the aging process as gracefully as possible. Perhaps one of the greatest benefits of becoming a woman of a certain age is the ability to laugh at myself, which is supposedly good for my health. In fact, I’m down right hilarious. Considering the amount of laughing I’m sure to do at my own expense in the coming years, I should be very healthy, indeed. Besides, it could be worse. If I were a dog, I’d be over three hundred and fifty years old in human years. On the other hand, in doggy years, I’m a young pup! Are you aging gracefully? If so, how? Let me know…I need all the help I can get! Author hotflashofgeniusPosted on September 13, 2013 Categories Aging GracefullyTags Ageing, Health, Humor2 Comments on Aging Gracefully?